Spurred on by constant encouragement/recommendations(/nagging) from my friend Thom (all well meant, of course), I’ve recently ‘gotten into’ comics and graphic novels. It’s taken me a while, sure, but this is mostly due to [misguided comment about comics no.1::] my latent fear of any book that so stringently directs your visual conception of its narrative as to actually have some guy(or guyess) draw you a picture of what’s happening in every single scene, the very notion of which I used to find irritatingly prescriptive in a kind of, like, here’s-what-to-read-and-what-to-see-and-you-will-have-no-say-in-the-matter way. But after a concerted effort to get over myself and recourse to frequent memorandums telling me that comics are actually different from novels (no really, they are), I’ve found myself genuinely enjoying the medium. My most notable [misguided comment about comics no.2::] comicular (that’s the adjective, right?) favourites thus far being: Warren Ellis’ Planetary, Grant Morrisons’ Arkham Asylum: A Serious House on Serious Earth, some Scott Pilgrim, some Phonogram and various and sundry DC/Marvel back-issues I’ve dipped in and out of. Of which in and out I have dipped. I’ve held back from reviewing a comic until now, however, chiefly out of an anxiety that I lack the requisite artistic experience/knowledge to adequately critique what is foremost a visual medium, and worried that I don’t possess or understand the language of the visual signifier enough to make any headway into writing a review that’s at all engaging or insightful, or interesting. Or readable. That anxiety’s still here, in buckets, but it seems apropos that just as I got over my fear of reading comics lest I find myself unable to engage with the form, I should likewise get over my fear of reviewing the same. So I’ve chosen for my first (adjective used optimistically) comic review Tintin in the Land of the Soviets – this for various reasons: I’ve often heard the likes of Tom McCarthy and China Miéville extolling the narrative depth and exegetic fruitfulness of Tintin’s adventures, and so perhaps Hergé’s books offer a relatively gentle “way-in” for a first time reviewer such as me. But principally I chose Tintin so I can avoid the potential (?) reviewerly faux pas of giving more credence to the writer than the artist, or the artist than the colourer, or the colourer than (more leftfield) the letterer etc. as polymath Hergé has all four bases covered himself. It’s tempting to begin a review of Tintin in the Land of the Soviets by lambasting its racist and clichéd portrayal of Soviet Russia; its patronising belittlement of Russian cultural achievements (“By Trotsky!” being the favourite native curse); its cast of offensively reductive, bearded, vodka-drinking Soviet stereotypes who converse in a ubiquitous cod-Marxist drivel talk (expect to read the word ‘Bourgeois’ over and over) and the sort of gross way it portrays Communists as not just politically dangerous and deceitful, but as intrinsically evil in every way (drowning dogs for the hell of it, etc.). But to claim the moral high ground in this way you’d have to ignore the entire textual provenance of Tintin in the Land of the Soviets as well as its convoluted post-publication history. Hergé, who working as a freelance pencil-for-hire was commissioned to compose the piece in 1929 as an anti-Communist educational guide for children, very quickly distanced himself from the work and frequently lamented its “political naivety”, even refusing to ink the book when, later in life, his publishers asked him to colour all of his early b&w strips. In some ways Tintin in the Land of the Soviets does represent the worst that comics has to offer – a propaganda piece cynically targeted at children with an agenda to engender both jingoism and xenophobia via fear-mongering, stereotyping and hearsay – but it’s nonetheless a charming and frequently funny story that functions as early document of the comic as longform medium. But as well as being an early example of comic working as sustained narrative, TITLOTS (whoa… this is one book I probably shouldn’t shorten to acronym…) Tintin in the Land of the Soviets is very much a proto-Tintin: the eponymous protagonist doesn’t even look like himself: he’s beefier, longer-nosed and his characteristic There’s Something About Mary-inspiring quiff is barely noticeable. Similarly the 2D, side-on perspective and uniformity of both panel size and layout offers no suggestion of the formal experimentation and artistic creativity that Tintin’s later adventures embody; aside, that is, for the occasional deviation to a kind of quasi-isometric camera angle and the functional ‘blacked out’ panel that indicates darkness. Also: Snowy talks in almost every panel – offering glib and sarcastic comments on events. There’s a Stewie Griffin-esque ‘can the other characters understand him?’ quandary that the reader has to deal with, and I opted for ‘no’, which elevates Snowy’s musings to the level of extradiegetic commentary – outside of the narrative and addressed to the reader – Snowy voices concerns over the incoherency of the plot and Tintin’s propensity for encountering danger while also making the kind of pithy observations that can only be read as author self-insertion, as Hergé wrestling with the less-than-wholesome vagaries of the politically loaded commission. The predominant thematic focus, such as it is, is disguise: and whether it’s Tintin’s conveniently stumbling around the back of a Soviet factory to discover a Hollywood-esque set of wooden facades and sound-effects masquerading as successful industrialism (a foil to convince Western Europe of Russian technical might), or Tintin’s own constant employment of ever more ludicrous costumes (a soldier, a Bolshevik, a ghost etc. – the latter conceived to expose the stupidity of the Russians who’re all terrified), disguise is always the ironic means by which deeper truths are uncovered – on both a physical level (Tintin’s soldier bluff grants him access to a secret Soviet meeting) and metaphoric (for e.g: the Soviet cover-up of the dearth of grain acts as metonymy for their lack of basic morality). 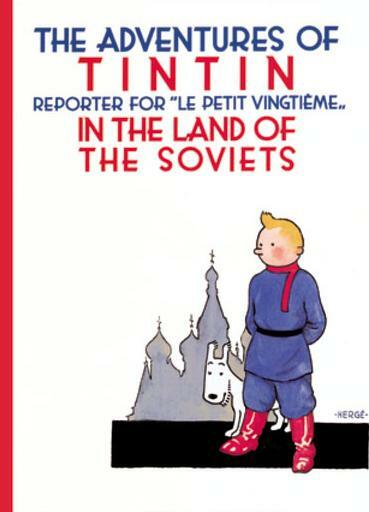 The Soviets’ use of deceit is implicitly tricksy and sinister – used to obscure the horrible truth of their regime – whereas Tintin’s disguise is set up in direct moral dichotomy to this: his tricks expose truth, theirs obscure it – a relationship clearly engineered to carry larger, real-world parallels with the political acts of the characters’ respective nations. But even using the word ‘characters’ is somewhat of a miscall: Tintin has definite journalistic clout, and Snowy is charmingly aloof – but Tintin in the Land of the Soviets’ supporting cast of generic, un-memorable [misguided comment about comics no.3::] sprites is just another (visual) incarnation of the theme of guising: the soviets are all the same – not characters in any artistic or writerly way, but homunculi for the easy expression of Hergé’s political stereotypes. It’s best to think of Tintin in the Land of the Soviets as a comic awash with the inauthentic: politically, visually and more literally in terms of plotting, costume and speech: the Soviets even like to spell out to one another their “evil” foreign policy plans and freely admit to their enormous political flaws in a manner utterly inconsistent with naturalistic dialogue. It’s perfectly fitting that a comic Hergé would come to regard as false and not true to himself is so preoccupied with mistaken identity and cover-up. For what it’s worth, I enjoyed reading it immensely, even if this enjoyment was coupled with a kind of moral trepidation at the comic’s overt agenda in a way that made me question my own readerly sensitivities. But that’s my first ever comic review just about done and dusted. If people like it I may well review the second Tintin adventure next month; after all, there’s no way that it can possibly more controversial than Tintin in the Land of the Soviets… right? This entry was posted in Reviews and tagged Herge, Tintin in the Land of the Soviets. Bookmark the permalink. Thanks again. This has had one of my lowest ever hit-rates for a new review (and that’s saying something: 10 hits is a ‘good day’ on this blog!) – so I’m not sure if I’ll try another comic review. Haven’t decided yet. I’d never really thought of Tintin either until, as I say, Tom McCarthy and China Mieville among others started writing about how deep/engaging it is, so I thought I’d give it a try! Well, entirely vindicated. A tremendous job. TITLOTS – that has just made me snigger really really loudly. Thank you Tomcat. I loved Tintin as a kid, then when the film came out I tried him again and still loved him but boy did I notice “It’s tempting to begin a review of Tintin in the Land of the Soviets by lambasting its racist and clichéd portrayal of Soviet Russia; its patronising belittlement of Russian cultural achievements (“By Trotsky!” being the favourite native curse); its cast of offensively reductive, bearded, vodka-drinking Soviet stereotypes who converse in a ubiquitous cod-Marxist drivel talk (expect to read the word ‘Bourgeois’ over and over) and the sort of gross way it portrays Communists as not just politically dangerous and deceitful, but as intrinsically evil in every way (drowning dogs for the hell of it, etc.). ” in most of the ones I tried. I guess it is because of the times they were written in. I wondered if they should be updated but maybe that would be some form of bastardisation? Haha, I genuinely didn’t see ‘TITLOTS’ until I’d typed it out. whoops. I definitely wouldn’t advocate censoring/”updating” Tintin; but I agree that this less than savoury handling of issues of race or gender (or whatever) is a difficult thing to encounter in something you otherwise enjoy. As liberal, enlightened readers (ahem…) I think it’s our duty to not throw the baby out with the bath water, so to speak. Sure this stuff is there, and it’s abhorrent, but I don’t think we should disregard the good parts, the values and merits of the work just because one aspect of it offends our moral sensitivities. It’s a problem I’m encountering a lot with H.P. Lovecraft at the moment – I genuinely, passionately love his writing – but he was a shocking racist. I guess it’s down to the caprice of the individual reader whether or not you accept these attitudes for what they were, and enjoy the unconnected values and beauty of the writing that appears in other places; or whether you reduce the entire work to a single issue and disregard it entirely. It’s tricky, and both approaches have strong arguments either way. I’m delighted to see you covering comics, even if it does mean I become a significant percentage of the blog traffic for each comic review. Comics never get the hits books do, because book blogs as a rule don’t attract comic fans (and comic blogs focus on different stuff than we tend to). This though is a great review, so even if it gets fewer readers it’s still well worth doing. Anyway, as ever with Tintin I love the cover. It’s a shame it’s such a terrible book. I’ve been considering retrying Tintin, and had this pegged as the one to start with. It’s been depegged. On jingoism by the way if you ever get to see any wartime Captain America it’s shocking in its overt racism. Understandable in the context, but the Japanese he fights are basically subhuman ape-men. It makes Lovecraft look, well, actually still pretty racist. I always loved Snowy’s asides, and as a kid took it as read that nobody in the comic heard them. Is the next one Tintin in the Congo by any chance? Yup, Tintin in the Congo is next. I’ve been putting off reviewing it because.. well, you probably know why because. If I can find the balls I’ll try and write about it: but part of me doesn’t even want to, and I worry that even a heavily critical review would be giving the work a kind of platform it doesn’t warrant. Not sure. Still ironing out my thoughts. Tough question. Is it actually the next one? Why did you pick these two to start with out of the various Tintins out there? McCarthy may not approve, but I always preferred Asterix. Yeah, Tintin in the Congo is the next one. Am going in the order he wrote and published them. Seems to make sense.